Our beautiful oversized Deluxe Zen Garden is perfect for any space including the home or the office. This two-piece Zen Garden set features an extra large Zen Garden Tray for sand which measures 24 inches x 13 inches. An additional smaller planter tray is used for a Bonsai tree (Bonsai tree not included). This tranquil zen garden makes an incredible statement when placed on a table be it indoor- or outdoors on a patio, rooftop or garden. 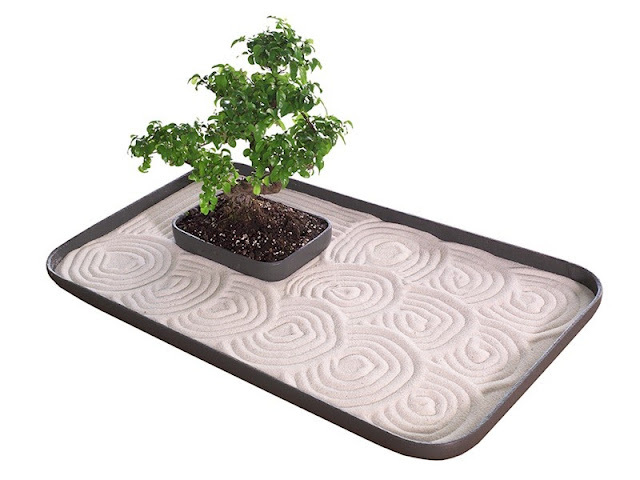 This is a great and unique zen garden set for anyone who needs a little relaxing and enjoys being creative. Every time you use this, you will feel the tranquility washing over you, just like true meditation. Its soft elegant shape makes it a beautiful decorative accent piece which compliments any setting. This modernist zen garden is handmade and imported from Switzerland. It has an anthracite finish as pictured. Zen gardens are places of rest, meditation and inspiration. Places where one finds on a small meditative journey to inner balance. This beautiful zen garden is made of natural fiber cement, a lightweight material that is 100% recyclable. Fiber cement ingredients are: cement, powdered limestone, cellulose and synthetic fibers, water and air. Plants love this natural and breathable material which regulates moisture. Production processes and materials (mostly sourced from Switzerland) ensure that this zen garden is completely resistant to frost and is meant to endure cold winters. Fiber cement is also colored all the way through, therefore there is no danger of the color chipping or fading. This Deluxe Zen Garden is manufactured exclusively for us in Switzerland. All pieces are designed by award winning European designers and are handmade by local Swiss artisan's whose signature can be found on every piece.